Low viscosity, fluid. Translucent when wet, clear when dry. Increases gloss, depth and intensity of colors it is applied over. 100% acrylic polymer varnish. Water soluble when wet. Good chemical and water resistance. Dry to a non-tacky, hard, flexible surface that is resistant to retention of dirt. Resists discoloring (non-yellowing, non-fogging) due to humidity, heat and ultraviolet light. Depending upon substrate, allows moisture to pass through (breathable). Not for use over oil paint. Protects acrylic color from harsh elements. Hard, archival, non-yellowing and water resistant when dry. For interior and exterior use Application Apply as a final varnish over dry acrylic paint. Varnish surface and environment must be clean, dry and dust free. Acrylic paintings must be completely dried and cured for 48-72 hours before varnishing. Application may be done by brush or spray. Generally a sprayed application will be thinner, smoother and more even. Rolling or sponging application is not recommended. Caution: Acrylic paints and mediums become increasingly brittle in cold weather. Do not apply below 60 oF. Brush and Paint Pad Application Use a wide, soft hair brush or paint pad (vacuum the pad prior to use to remove lint). Size of area to be varnished will determine the size of the applicator. The smaller the surface area, the narrower the brush. Generally, a 1-4" flat brush is used. Apply varnish in 1-3 thin coats, rather than 1 thick coat. A thick coat will take longer to dry, may dry cloudy, may drip or sag during application and has a greater chance of showing brush strokes when dry. Horizontal surface application is best with less chance of varnish running. After varnishing, the surface should be shielded with a protective "tent". This will prevent any dust or airborne particles from settling into varnish as it dries. Apply varnish in slightly overlapping pattern that covers entire artwork. Apply in horizontal and vertical brush strokes, so that entire area is evenly coated. Do not rework areas you might miss as the brush could pick up partially dried varnish and cause clouding. If areas are missed, wait until the varnish is dry and apply another coat. When applying Liquitex Matte Varnish or Satin Varnish, apply no more than 1-2 thin coats. A thick application may result in cloudiness when dry. If more than 2 coats are desired, first varnish with Gloss Varnish until desired thickness is achieved, then final varnish with matte or satin varnish. Spray Application Refer to Techniques and search on Airbrushing for more detailed information. Most even application method. Use for textured surfaces (thick impasto, thick textures), where brush application may result in foaming and fragile surfaces (watercolor, tempera, graphite, pastel, gouache), where brush application may disrupt drawing or painted surface. Select air pressure (PSI) depending on air gun used and viscosity of varnish. Greater PSI permits thicker varnish to be sprayed, but may affect fragile surfaces. 2-3 light even coats are better than 1 thick coat. Spray a continuous film by moving the spray gun in a smooth motion from one side of the painting to the other. First coat horizontal, second coat, third coat horizontal, etc. During spray application. maintain same distance across the surface of the artwork. Move your body as well as your arm to avoid "arching" motion and uneven application. Thinning Do not thin, as it will weaken the varnish film and adhesion. Removal Not removable. 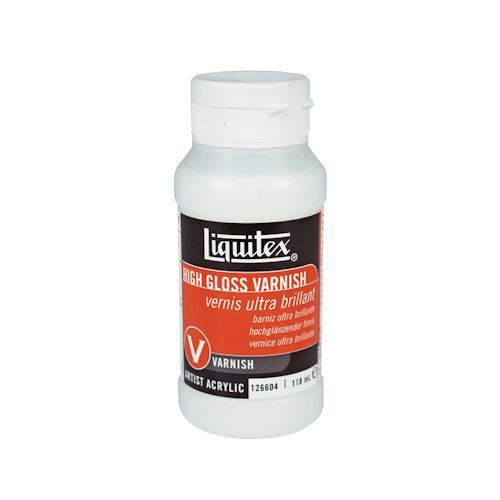 Do not attempt to remove these varnishes with harsh solvents.